I used to make a version of this before I was sticking to a low-carb diet. It was good enough to miss, so I modified it to be “legal” for a low-carb meal. It still tastes great and it’s a good meal for families that aren’t all following a low-carb diet, as any variety of noodles can be added to the sauce at the end. 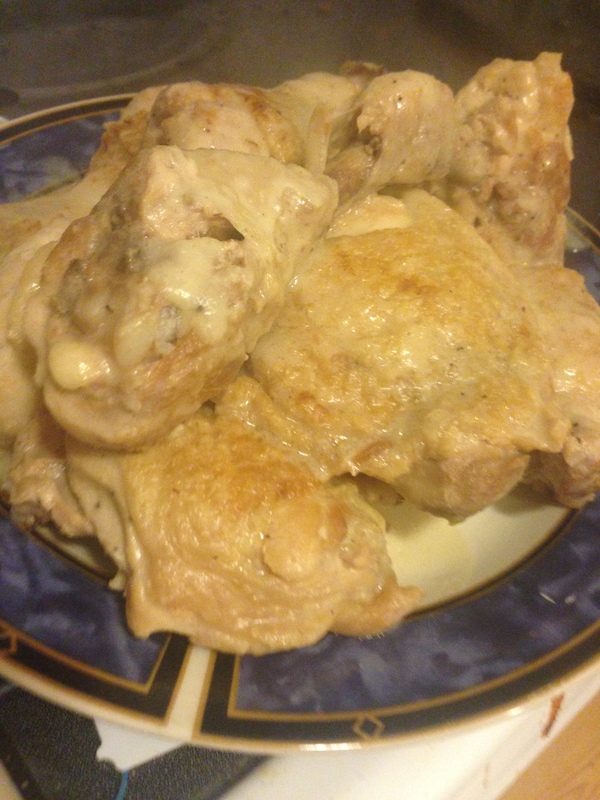 Braising meat in a cream sauce instead of a clear broth is not a typical cooking method, but searing the chicken and then braising it with the sauce all in one pan makes sure none of the great flavor from the searing process goes to waste. It also has the added bonus of leaving you with a ready to use pasta sauce once the meat is done. 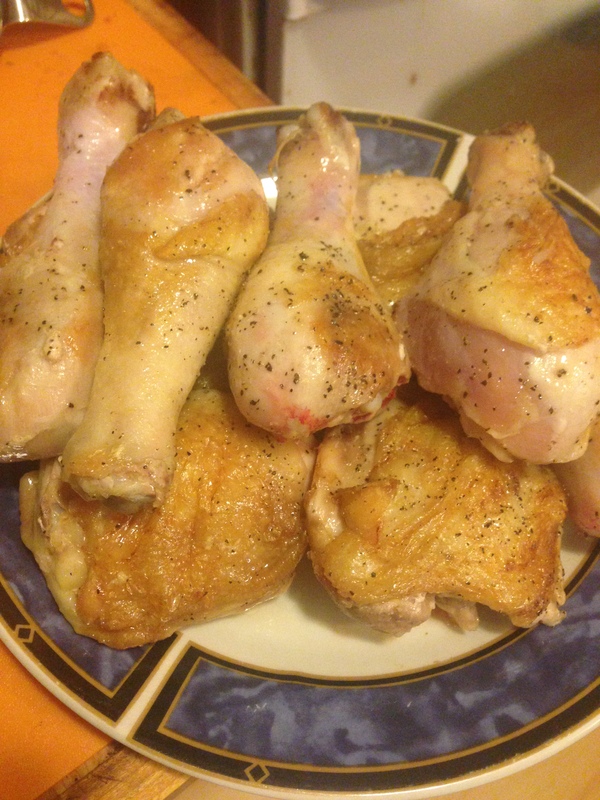 In a hot 3 qt sauce pan, brown the pieces of chicken on both sides. Remove them from the pan and set them aside. Add the white sauce, mushrooms, thyme, and shredded cheese to the pan, and mix well. When everything is smooth, add the green beans. 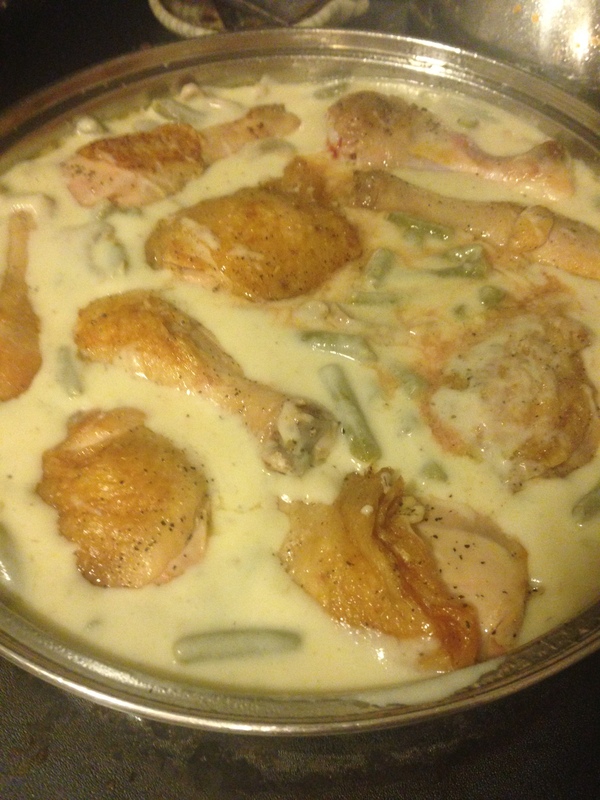 Add the chicken back into the pan, and nestle the pieces down into the sauce. Put the lid on the pan, and cook over medium low heat for 20 minutes. Flip the pieces of chicken over, and try to stir up the bottom of the pan while you’re turning the chicken. Put the lid back on and cook for another 20 minutes. When the chicken is cooked through, remove it from the pan. This is easiest to do with a pair of tongs. Mix the sauce and green beans with the noodles of your choice. I make some regular egg noodles for my family with half the sauce and beans, and I mix the rest with shirataki noodles for myself. Serve the noodles with a few pieces of chicken and enjoy.